Hi i need your help, can’t find a solution in the forum. I use dark hero image and the nav menu and the logo are in white color. Now i set sticky nav. The nav bar should be the color white. The problem is that the logo and the nav menu still in white. how can i change the logo and the Colors for the sticky nav aber but not for the hero. Hope you understand and you have a solution for me. Thanks. 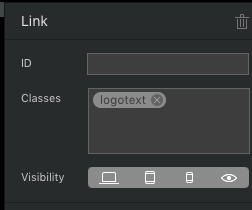 You can ad a class like .logo-text and set there the coulor of text. Thanks, but i don’t know, how i can make the changes in the sticky nav bar. Sorry. Ebenfalls eine Klasse für die Menupünkte anlegen und diese dann jedem einzelnen Menupunkt zuordnen. Die Data source auf “none” setzen, dann kommt man an die einzelnen Menupunkte dran. @pixelwork Danke Dir. Das mit der Klasse für jeden Punkt ist mir klar. Damit kann ich die NavLieste im Hero ändern und habe dies auch so getan. Die Schwierigkeit besteht aber darin, wie ich die Klasse dann für die fixe Navleiste ändern, die ich gar nicht sehe. Ich sehe nur den Hero und nicht die Sticky Nav Leiste. Diese erscheint ja erst im Browser, wenn ich runter scrolle. Obviously there is no chance to ajust and style sticky navbar in a hero. Thats realy a Pitty - only white and not even being able to change margin and padding - no access to the navbar even via subclasses.